Oyster shell or “Spiny Oyster Shell” earrings and jewelry have a rich history within Native American jewelry. One of the most famous styles of beaded jewelry from the Native art of Heishi beaded necklaces incorporates oyster shell and seashells, almost exclusively. These stones are believed to harness the power of the ocean where they come from and provide a sense of connectivity to nature in a much more broad sense as well. The coloration of oyster shell earrings vary drastically, as with most mineral deposits. Depending on the chemicals and elements in the area that the oysters use to form their shells, the colors can be from the darkest hue of purple to a beautiful and vibrant orange. The shells then are refined even further until they have a clear glossy finish, leaving the shell smoother than any natural stone. Native Americans have taken advantage of this fact by creating pieces that utilize the array of colors to make their pieces. Many incorporate sterling silver with these pieces, just as they do with most other gems, like turquoise. Many use oyster shell in place of coral, because of its abundance and the variation of color to create truly stunning pieces of jewelry. As far as shapes go, the Navajo and many other tribes that use oyster shell quite frequently stick to basic geometric shapes because of the difficulty in cutting these pieces. Many will see simple triangular or oval shaped earrings and jewelry pieces. People that are looking into oyster shell earrings should take advantage of the vast amount of coloration that is typically seen in oyster shell earrings to mix and match as you see fit. The art of crafting jewelry from seashells and oyster shell stretches back thousands of years and was popularized by Native American trade to settlers. 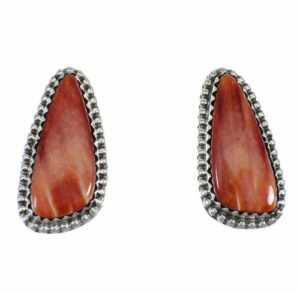 Oyster shell earrings and other jewelry pieces are truly something to behold and available through multiple tribes and their artists in the Southwest region.